FlowSyn is a fully integrated, 2 channel benchtop continuous flow reactor that combines 2 high pressure pump channels and 2 reactor modules in a single compact unit. FlowSyn’s high resolution user interface quickly guides you through the process of setting up and running flow chemistry reactions. The unit can operate in either manual or fully automated modes, in the latter case ensuring that critical experiment parameters remain within defined limits, and can easily be reconfigured for a variety of experiments. Pump performance is constantly monitored and the user is alerted to potential flow rate variations. All FlowSyns are fitted with the latest specification chemically resistant pump heads and injection valves, and can be specified with either PTFE, 316L stainless steel or Hastelloy C-276 flow paths for optimal chemical compatibility. 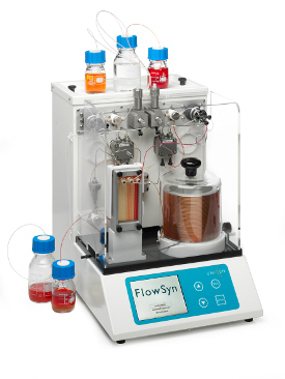 Choose FlowSyn for small scale single reactions (flow rate up to 20 ml/min). Add HotCoil(s) to increase reactor volume and throughput. For even higher throughput, choose FlowSyn Maxi. Upgrade by adding a Multi-X fraction collector package in order to automatically run up to 10 sequential reactions, a Binary Pump Module to add additional pump channels, or a Polar Bear Plus Flow cryogenic reactor module.